This article is about the current Apple operating system for Mac computers. For pre-2001 versions, see Classic Mac OS. "OSX" and "OS X" redirect here. For other uses, see OSX (disambiguation). macOS (/ˌmækʔoʊˈɛs/; previously Mac OS X and later OS X, Roman numeral "X" pronounced "ten") is a series of graphical operating systems developed and marketed by Apple Inc. since 2001. It is the primary operating system for Apple's Mac family of computers. Within the market of desktop, laptop and home computers, and by web usage, it is the second most widely used desktop OS, after Microsoft Windows. macOS is the second major series of Macintosh operating systems. The first is colloquially called the "classic" Mac OS, which was introduced in 1984, and the final release of which was Mac OS 9 in 1999. The first desktop version, Mac OS X 10.0, was released in March 2001, with its first update, 10.1, arriving later that year. After this, Apple began naming its releases after big cats, which lasted until OS X 10.8 Mountain Lion. Since OS X 10.9 Mavericks, releases have been named after locations in California. Apple shortened the name to "OS X" in 2012 and then changed it to "macOS" in 2016, adopting the nomenclature that they were using for their other operating systems, iOS, watchOS, and tvOS. The latest version is macOS Mojave, which was publicly released in September 2018. Between 1999 and 2009, Apple sold a separate series of operating systems called Mac OS X Server. The initial version, Mac OS X Server 1.0, was released in 1999 with a user interface similar to Mac OS 8.5. After this, new versions were introduced concurrently with the desktop version of Mac OS X. Beginning with Mac OS X 10.7 Lion, the server functions were made available as a separate package on the Mac App Store. macOS is based on technologies developed between 1985 and 1997 at NeXT, a company that Apple co-founder Steve Jobs created after leaving the company. The "X" in Mac OS X and OS X is the Roman numeral for the number 10 and is pronounced as such. The X was a prominent part of the operating system's brand identity and marketing in its early years, but gradually receded in prominence since the release of Snow Leopard in 2009. UNIX 03 certification was achieved for the Intel version of Mac OS X 10.5 Leopard and all releases from Mac OS X 10.6 Snow Leopard up to the current version also have UNIX 03 certification. macOS shares its Unix-based core, named Darwin, and many of its frameworks with iOS, tvOS and watchOS. A heavily modified version of Mac OS X 10.4 Tiger was used for the first-generation Apple TV. Releases of Mac OS X from 1999 to 2005 ran on the PowerPC-based Macs of that period. After Apple announced that they were switching to Intel CPUs from 2006 onwards, versions were released for 32-bit and 64-bit Intel-based Macs. Versions from Mac OS X 10.7 Lion (2011) run exclusively on 64-bit Intel CPUs, in contrast to the ARM architecture used on iOS and watchOS devices, and do not support PowerPC applications. The heritage of what would become macOS had originated at NeXT, a company founded by Steve Jobs following his departure from Apple in 1985. There, the Unix-like NeXTSTEP operating system was developed, and then launched in 1989. The kernel of NeXTSTEP is based upon the Mach kernel, which was originally developed at Carnegie Mellon University, with additional kernel layers and low-level user space code derived from parts of BSD. Its graphical user interface was built on top of an object-oriented GUI toolkit using the Objective-C programming language. Throughout the early 1990s, Apple had tried to create a "next-generation" OS to succeed its classic Mac OS through the Taligent, Copland and Gershwin projects, but all of them were eventually abandoned. This led Apple to purchase NeXT in 1996, allowing NeXTSTEP, then called OPENSTEP, to serve as the basis for Apple's next generation operating system. This purchase also led to Steve Jobs returning to Apple as an interim, and then the permanent CEO, shepherding the transformation of the programmer-friendly OPENSTEP into a system that would be adopted by Apple's primary market of home users and creative professionals. The project was first code named "Rhapsody" and then officially named Mac OS X.
Mac OS X was originally presented as the tenth major version of Apple's operating system for Macintosh computers; current versions of macOS retain the major version number "10". Previous Macintosh operating systems (versions of the classic Mac OS) were named using Arabic numerals, as with Mac OS 8 and Mac OS 9. The letter "X" in Mac OS X's name refers to the number 10, a Roman numeral. It is therefore correctly pronounced "ten" in this context. However, it is also commonly pronounced like the letter "X". The first version of Mac OS X, Mac OS X Server 1.0, was a transitional product, featuring an interface resembling the classic Mac OS, though it was not compatible with software designed for the older system. Consumer releases of Mac OS X included more backward compatibility. Mac OS applications could be rewritten to run natively via the Carbon API; many could also be run directly through the Classic Environment with a reduction in performance. The consumer version of Mac OS X was launched in 2001 with Mac OS X 10.0. Reviews were variable, with extensive praise for its sophisticated, glossy Aqua interface but criticizing it for sluggish performance. With Apple's popularity at a low, the makers of several classic Mac applications such as FrameMaker and PageMaker declined to develop new versions of their software for Mac OS X. Ars Technica columnist John Siracusa, who reviewed every major OS X release up to 10.10, described the early releases in retrospect as 'dog-slow, feature poor' and Aqua as 'unbearably slow and a huge resource hog'. Apple rapidly developed several new releases of Mac OS X. Siracusa's review of version 10.3, Panther, noted "It's strange to have gone from years of uncertainty and vaporware to a steady annual supply of major new operating system releases." Version 10.4, Tiger, reportedly shocked executives at Microsoft by offering a number of features, such as fast file searching and improved graphics processing, that Microsoft had spent several years struggling to add to Windows with acceptable performance. As the operating system evolved, it moved away from the classic Mac OS, with applications being added and removed. Considering music to be a key market, Apple developed the iPod music player and music software for the Mac, including iTunes and GarageBand. Targeting the consumer and media markets, Apple emphasized its new "digital lifestyle" applications such as the iLife suite, integrated home entertainment through the Front Row media center and the Safari web browser. With increasing popularity of the internet, Apple offered additional online services, including the .Mac, MobileMe and most recently iCloud products. It later began selling third-party applications through the Mac App Store. Newer versions of Mac OS X also included modifications to the general interface, moving away from the striped gloss and transparency of the initial versions. Some applications began to use a brushed metal appearance, or non-pinstriped titlebar appearance in version 10.4. In Leopard, Apple announced a unification of the interface, with a standardized gray-gradient window style. In 2006, the first Intel Macs released used a specialized version of Mac OS X 10.4 Tiger. A key development for the system was the announcement and release of the iPhone from 2007 onwards. While Apple's previous iPod media players used a minimal operating system, the iPhone used an operating system based on Mac OS X, which would later be called "iPhone OS" and then iOS. The simultaneous release of two operating systems based on the same frameworks placed tension on Apple, which cited the iPhone as forcing it to delay Mac OS X 10.5 Leopard. However, after Apple opened the iPhone to third-party developers its commercial success drew attention to Mac OS X, with many iPhone software developers showing interest in Mac development. In 2007, Mac OS X 10.5 Leopard was the sole release with universal binary components, allowing installation on both Intel Macs and select PowerPC Macs. It is also the final release with PowerPC Mac support. Mac OS X 10.6 Snow Leopard was the first version of OS X to be built exclusively for Intel Macs, and the final release with 32-bit Intel Mac support. The name was intended to signal its status as an iteration of Leopard, focusing on technical and performance improvements rather than user-facing features; indeed it was explicitly branded to developers as being a 'no new features' release. Since its release, several OS X or macOS releases (namely OS X Mountain Lion, OS X El Capitan and macOS High Sierra) follow this pattern, with a name derived from its predecessor, similar to the 'tick-tock model' used by Intel. In two succeeding versions, Lion and Mountain Lion, Apple moved some applications to a highly skeuomorphic style of design inspired by contemporary versions of iOS, at the same time simplifying some elements by making controls such as scroll bars fade out when not in use. 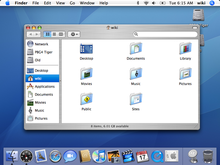 This direction was, like brushed metal interfaces, unpopular with some users, although it continued a trend of greater animation and variety in the interface previously seen in design aspects such as the Time Machine backup utility, which presented past file versions against a swirling nebula, and the glossy translucent dock of Leopard and Snow Leopard. In addition, with Mac OS X 10.7 Lion, Apple ceased to release separate server versions of Mac OS X, selling server tools as a separate downloadable application through the Mac App Store. A review described the trend in the server products as becoming "cheaper and simpler... shifting its focus from large businesses to small ones." In 2012, with the release of OS X 10.8 Mountain Lion, the name of the system was shortened from Mac OS X to OS X. That year, Apple removed the head of OS X development, Scott Forstall, and design was changed towards a more minimal direction. Apple's new user interface design, using deep color saturation, text-only buttons and a minimal, 'flat' interface, was debuted with iOS 7 in 2013. With OS X engineers reportedly working on iOS 7, the version released in 2013, OS X 10.9 Mavericks, was something of a transitional release, with some of the skeuomorphic design removed, while most of the general interface of Mavericks remained unchanged. The next version, OS X 10.10 Yosemite, adopted a design similar to iOS 7 but with greater complexity suitable for an interface controlled with a mouse. From 2012 onwards, the system has shifted to an annual release schedule similar to that of iOS. It also steadily cut the cost of updates from Snow Leopard onwards, before removing upgrade fees altogether from 2013 onwards. Some journalists and third-party software developers have suggested that this decision, while allowing more rapid feature release, meant less opportunity to focus on stability, with no version of OS X recommendable for users requiring stability and performance above new features. Apple's 2015 update, OS X 10.11 El Capitan, was announced to focus specifically on stability and performance improvements. In 2016, with the release of macOS 10.12 Sierra, the name was changed from OS X to macOS to streamline it with the branding of Apple's other primary operating systems: iOS, watchOS, and tvOS. macOS 10.12 Sierra's main features are the introduction of Siri to macOS, Optimized Storage, improvements to included applications, and greater integration with Apple's iPhone and Apple Watch. The Apple File System (APFS) was announced at the Apple Worldwide Developers Conference in 2016 as a replacement for HFS+, a highly criticized file system. Apple previewed macOS 10.13 High Sierra at the 2017 Worldwide Developers Conference, before releasing it later that year. When running on solid state drives, it uses APFS, rather than HFS+. Its successor, macOS 10.14 Mojave, was released in 2018, adding a dark user interface option and a dynamic wallpaper setting. At macOS's core is a POSIX-compliant operating system built on top of the XNU kernel, with standard Unix facilities available from the command line interface. Apple has released this family of software as a free and open source operating system named Darwin. On top of Darwin, Apple layered a number of components, including the Aqua interface and the Finder, to complete the GUI-based operating system which is macOS. With its original introduction as Mac OS X, the system brought a number of new capabilities to provide a more stable and reliable platform than its predecessor, the classic Mac OS. For example, pre-emptive multitasking and memory protection improved the system's ability to run multiple applications simultaneously without them interrupting or corrupting each other. Many aspects of macOS's architecture are derived from OPENSTEP, which was designed to be portable, to ease the transition from one platform to another. For example, NeXTSTEP was ported from the original 68k-based NeXT workstations to x86 and other architectures before NeXT was purchased by Apple, and OPENSTEP was later ported to the PowerPC architecture as part of the Rhapsody project. Prior to macOS High Sierra, and on drives other than solid state drives (SSDs), the default file system is HFS+, which it inherited from the classic Mac OS. Operating system designer Linus Torvalds has criticized HFS+, saying it is "probably the worst file system ever", whose design is "actively corrupting user data". He criticized the case insensitivity of file names, a design made worse when Apple extended the file system to support Unicode. Initially, HFS+ was designed for classic Mac OS, which runs on big-endian 68K and PowerPC systems. When Apple switched Macintosh to little-endian Intel processors, it continued to use big-endian byte order on HFS+ file systems. As a result, macOS on current Macs must do byte swap when it reads file system data. These concerns are being addressed with the new Apple File System, which is used for file systems on SSDs in macOS High Sierra. The Darwin subsystem in macOS is in charge of managing the file system, which includes the Unix permissions layer. In 2003 and 2005, two Macworld editors expressed criticism of the permission scheme; Ted Landau called misconfigured permissions "the most common frustration" in macOS, while Rob Griffiths suggested that some users may even have to reset permissions every day, a process which can take up to 15 minutes. More recently, another Macworld editor, Dan Frakes, called the procedure of repairing permissions vastly overused. He argues that macOS typically handles permissions properly without user interference, and resetting permissions should only be tried when problems emerge. The architecture of macOS incorporates a layered design: the layered frameworks aid rapid development of applications by providing existing code for common tasks. Apple provides its own software development tools, most prominently an integrated development environment called Xcode. Xcode provides interfaces to compilers that support several programming languages including C, C++, Objective-C, and Swift. For the Apple–Intel transition, it was modified so that developers could build their applications as a universal binary, which provides compatibility with both the Intel-based and PowerPC-based Macintosh lines. First and third-party applications can be controlled programatically using the AppleScript framework, retained from the classic Mac OS, or using the newer Automator application that offers pre-written tasks that do not require programming knowledge. ^ Messages 8.0b Archived April 17, 2017, at the Wayback Machine was a beta release that only functioned from February 16 to December 12, 2012. Afterwards, users could either revert to iChat or upgrade to a newer version of OS X (10.8 "Mountain Lion" for US$19.99, or 10.9 "Mavericks" or newer for free) to continue using Messages. ^ Keynote 1.0 is the only iLife program that is compatible with Mac OS X 10.2 "Jaguar". Two minor updates, 1.1 and 1.1.1, can be applied to this version. ^ iTunes 2.0.4 can only run if Classic is installed. Otherwise, Mac OS X 10.0 can only run iTunes 1.1.1 natively. Apple offered two main APIs to develop software natively for macOS: Cocoa and Carbon. Cocoa was a descendant of APIs inherited from OPENSTEP with no ancestry from the classic Mac OS, while Carbon was an adaptation of classic Mac OS APIs, allowing Mac software to be minimally rewritten in order to run natively on Mac OS X. The Cocoa API was created as the result of a 1993 collaboration between NeXT Computer and Sun Microsystems. This heritage is highly visible for Cocoa developers, since the "NS" prefix is ubiquitous in the framework, standing variously for NeXTSTEP or NeXT/Sun. The official OPENSTEP API, published in September 1994, was the first to split the API between Foundation and ApplicationKit and the first to use the "NS" prefix. Traditionally, Cocoa programs have been mostly written in Objective-C, with Java as an alternative. However, on July 11, 2005, Apple announced that "features added to Cocoa in Mac OS X versions later than 10.4 will not be added to the Cocoa-Java programming interface." macOS also used to support the Java Platform as a "preferred software package"—in practice this means that applications written in Java fit as neatly into the operating system as possible while still being cross-platform compatible, and that graphical user interfaces written in Swing look almost exactly like native Cocoa interfaces. Since 2014, Apple has promoted its new programming language Swift as the preferred language for software development on Apple platforms. Apple's original plan with macOS was to require all developers to rewrite their software into the Cocoa APIs. This caused much outcry among existing Mac developers, who threatened to abandon the platform rather than invest in a costly rewrite, and the idea was shelved. To permit a smooth transition from Mac OS 9 to Mac OS X, the Carbon Application Programming Interface (API) was created. Applications written with Carbon were initially able to run natively on both classic Mac OS and Mac OS X, although this ability was later dropped as Mac OS X developed. Carbon was not included in the first product sold as Mac OS X: the little-used original release of Mac OS X Server 1.0, which also did not include the Aqua interface. Apple limited further development of Carbon from the release of Leopard onwards, announcing Carbon applications would not receive the ability to run at 64-bit. A number of macOS applications continued to use Carbon for some time afterwards, especially ones with heritage dating back to the classic Mac OS and for which updates would be difficult, uneconomic or not necessary. This included Microsoft Office up to Office 2016, and Photoshop up to CS5. Early versions of macOS could also run some classic Mac OS applications through the Classic Environment with performance limitations; this feature was removed from 10.5 onwards and all Macs using Intel processors. Because macOS is POSIX compliant, many software packages written for the other Unix-like systems including Linux can be recompiled to run on it, including much scientific and technical software. Third-party projects such as Homebrew, Fink, MacPorts and pkgsrc provide pre-compiled or pre-formatted packages. 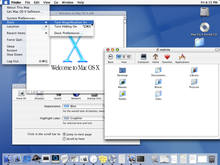 Apple and others have provided versions of the X Window System graphical interface which can allow these applications to run with an approximation of the macOS look-and-feel. The current Apple-endorsed method is the open-source XQuartz project; earlier versions could use the X11 application provided by Apple, or before that the XDarwin project. Applications can be distributed to Macs and installed by the user from any source and by any method such as downloading (with or without code signing, available via an Apple developer account) or through the Mac App Store, a marketplace of software maintained by Apple by way of a process requiring the company's approval. Apps installed through the Mac App Store run within a sandbox, restricting their ability to exchange information with other applications or modify the core operating system and its features. This has been cited as an advantage, by allowing users to install apps with confidence that they should not be able to damage their system, but also as a disadvantage due to blocking the Mac App Store's use for professional applications that require elevated privileges. Applications without any code signature cannot be run by default except from a computer's administrator account. Apple produces macOS applications, some of which are included and some sold separately. This includes iWork, Final Cut Pro, Logic Pro, iLife, and the database application FileMaker. Numerous other developers also offer software for macOS. In 2018 Apple introduced an application layer, reportedly codenamed Marzipan, to port iOS apps to macOS. macOS Mojave included ports of four first-party iOS apps including Home and News, and it was announced that the API would be available for third-party developers to use from 2019. Rosetta support dropped from 10.7 and newer. Tools such as XPostFacto and patches applied to the installation media have been developed by third parties to enable installation of newer versions of macOS on systems not officially supported by Apple. This includes a number of pre-G3 Power Macintosh systems that can be made to run up to and including Mac OS X 10.2 Jaguar, all G3-based Macs which can run up to and including Tiger, and sub-867 MHz G4 Macs can run Leopard by removing the restriction from the installation DVD or entering a command in the Mac's Open Firmware interface to tell the Leopard Installer that it has a clock rate of 867 MHz or greater. Except for features requiring specific hardware such as graphics acceleration or DVD writing, the operating system offers the same functionality on all supported hardware. As most Mac hardware components, or components similar to those, since the Intel transition are available for purchase, some technology-capable groups have developed software to install macOS on non-Apple computers. These are referred to as Hackintoshes, a portmanteau of the words "hack" and "Macintosh". This violates Apple's EULA (and is therefore unsupported by Apple technical support, warranties etc. ), but communities that cater to personal users, who do not install for resale and profit, have generally been ignored by Apple. These self-made computers allow more flexibility and customization of hardware, but at a cost of leaving the user more responsible for their own machine, such as on matter of data integrity or security. Psystar, a business that attempted to profit from selling macOS on non-Apple certified hardware, was sued by Apple in 2008. Steve Jobs talks about the transition to Intel processors. In April 2002, eWeek announced a rumor that Apple had a version of Mac OS X code-named Marklar, which ran on Intel x86 processors. The idea behind Marklar was to keep Mac OS X running on an alternative platform should Apple become dissatisfied with the progress of the PowerPC platform. These rumors subsided until late in May 2005, when various media outlets, such as The Wall Street Journal and CNET, announced that Apple would unveil Marklar in the coming months. 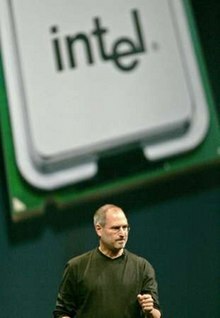 On June 6, 2005, Steve Jobs announced in his keynote address at the annual Apple Worldwide Developers Conference that Apple would be making the transition from PowerPC to Intel processors over the following two years, and that Mac OS X would support both platforms during the transition. Jobs also confirmed rumors that Apple had versions of Mac OS X running on Intel processors for most of its developmental life. Intel-based Macs would run a new recompiled version of OS X along with Rosetta, a binary translation layer which enables software compiled for PowerPC Mac OS X to run on Intel Mac OS X machines. The system was included with Mac OS X versions up to version 10.6.8. Apple dropped support for Classic mode on the new Intel Macs. Third party emulation software such as Mini vMac, Basilisk II and SheepShaver provided support for some early versions of Mac OS. A new version of Xcode and the underlying command-line compilers supported building universal binaries that would run on either architecture. PowerPC-only software is supported with Apple's official emulation software, Rosetta, though applications eventually had to be rewritten to run properly on the newer versions released for Intel processors. Apple initially encouraged developers to produce universal binaries with support for both PowerPC and Intel. There is a performance penalty when PowerPC binaries run on Intel Macs through Rosetta. Moreover, some PowerPC software, such as kernel extensions and System Preferences plugins, are not supported on Intel Macs at all. Some PowerPC applications would not run on macOS at all. Plugins for Safari need to be compiled for the same platform as Safari, so when Safari is running on Intel, it requires plug-ins that have been compiled as Intel-only or universal binaries, so PowerPC-only plug-ins will not work. While Intel Macs are able to run PowerPC, Intel, and universal binaries; PowerPC Macs support only universal and PowerPC builds. Support for the PowerPC platform was dropped following the transition. In 2009, Apple announced at its Worldwide Developers Conference that Mac OS X 10.6 Snow Leopard would drop support for PowerPC processors and be Intel-only. Rosetta continued to be offered as an optional download or installation choice in Snow Leopard before it was discontinued with Mac OS X 10.7 Lion. In addition, new versions of Mac OS X first- and third-party software increasingly required Intel processors, including new versions of iLife, iWork, Aperture and Logic Pro. One of the major differences between the classic Mac OS and the current macOS was the addition of Aqua, a graphical user interface with water-like elements, in the first major release of Mac OS X. Every window element, text, graphic, or widget is drawn on-screen using spatial anti-aliasing technology. ColorSync, a technology introduced many years before, was improved and built into the core drawing engine, to provide color matching for printing and multimedia professionals. Also, drop shadows were added around windows and isolated text elements to provide a sense of depth. New interface elements were integrated, including sheets (dialog boxes attached to specific windows) and drawers, which would slide out and provide options. The use of soft edges, translucent colors, and pinstripes, similar to the hardware design of the first iMacs, brought more texture and color to the user interface when compared to what Mac OS 9 and Mac OS X Server 1.0's "Platinum" appearance had offered. According to Siracusa, the introduction of Aqua and its departure from the then conventional look "hit like a ton of bricks. "Bruce Tognazzini (who founded the original Apple Human Interface Group) said that the Aqua interface in Mac OS X 10.0 represented a step backwards in usability compared with the original Mac OS interface. Third-party developers started producing skins for customizable applications and other operating systems which mimicked the Aqua appearance. To some extent, Apple has used the successful transition to this new design as leverage, at various times threatening legal action against people who make or distribute software with an interface the company says is derived from its copyrighted design. Apple has continued to change aspects of the macOS appearance and design, particularly with tweaks to the appearance of windows and the menu bar. Since 2012, Apple has sold many of its Mac models with high-resolution Retina displays, and macOS and its APIs have extensive support for resolution-independent development on supporting high-resolution displays. Reviewers have described Apple's support for the technology as superior to that on Windows. The human interface guidelines published by Apple for macOS are followed by many applications, giving them consistent user interface and keyboard shortcuts. In addition, new services for applications are included, which include spelling and grammar checkers, special characters palette, color picker, font chooser and dictionary; these global features are present in every Cocoa application, adding consistency. The graphics system OpenGL composites windows onto the screen to allow hardware-accelerated drawing. This technology, introduced in version 10.2, is called Quartz Extreme, a component of Quartz. Quartz's internal imaging model correlates well with the Portable Document Format (PDF) imaging model, making it easy to output PDF to multiple devices. As a side result, PDF viewing and creating PDF documents from any application are built-in features. Reflecting its popularity with design users, macOS also has system support for a variety of professional video and image formats and includes an extensive pre-installed font library, featuring many prominent brand-name designs. The Finder is a file browser allowing quick access to all areas of the computer, which has been modified throughout subsequent releases of macOS. Quick Look is part of the Finder since version 10.5. It allows for dynamic previews of files, including videos and multi-page documents without opening any other applications. Spotlight, a file searching technology which has been integrated into the Finder since version 10.4, allows rapid real-time searches of data files; mail messages; photos; and other information based on item properties (metadata) and/or content. macOS makes use of a Dock, which holds file and folder shortcuts as well as minimized windows. Apple added "Exposé" in version 10.3 (called Mission Control since version 10.7), a feature which includes three functions to help accessibility between windows and desktop. Its functions are to instantly display all open windows as thumbnails for easy navigation to different tasks, display all open windows as thumbnails from the current application, and hide all windows to access the desktop. Also, FileVault was introduced, which is an optional encryption of the user's files with the 128-bit Advanced Encryption Standard (AES-128). Features introduced in version 10.4 include Automator, an application designed to create an automatic workflow for different tasks; Dashboard, a full-screen group of small applications called desktop widgets that can be called up and dismissed in one keystroke; and Front Row, a media viewer interface accessed by the Apple Remote. Moreover, the Sync Services were included, which is a system that allows applications to access a centralized extensible database for various elements of user data, including calendar and contact items. The operating system then managed conflicting edits and data consistency. All system icons are scalable up to 512×512 pixels as of version 10.5 to accommodate various places where they appear in larger size, including for example the Cover Flow view, a three-dimensional graphical user interface included with iTunes, the Finder, and other Apple products for visually skimming through files and digital media libraries via cover artwork. That version also introduced Spaces, a virtual desktop implementation which enables the user to have more than one desktop and display them in an Exposé-like interface; an automatic backup technology called Time Machine, which provides the ability to view and restore previous versions of files and application data; and Screen Sharing was built in for the first time. In more recent releases, Apple has developed support for emoji characters by including the proprietary Apple Color Emoji font. Apple has also connected macOS with social networks such as Twitter and Facebook through the addition of share buttons for content such as pictures and text. Apple has brought several applications and features that originally debuted in iOS, its mobile operating system, to macOS in recent releases, notably the intelligent personal assistant Siri, which was introduced in version 10.12 of macOS. There are 38 system languages available in macOS for the user at the moment of installation; the system language is used throughout the entire operating system environment. Input methods for typing in dozens of scripts can be chosen independently of the system language. Recent updates have added increased support for Chinese characters and interconnections with popular social networks in China. macOS can be updated using the Software Update preference pane in System Preferences or the softwareupdate command line utility. Until OS X 10.8 Mountain Lion, a separate Software Update application performed this functionality. In Mountain Lion and later, this was merged into the Mac App Store application, although the underlying update mechanism remains unchanged and is fundamentally different than the download mechanism used when purchasing an App Store application. In macOS 10.14 Mojave, the updating function was moved again to the Software Update preference pane. Box/Mac App Store artwork for every version of macOS. Left to right: Cheetah/Puma (1), Jaguar (2), Panther (3), Tiger (4), Leopard (5), Snow Leopard (6), Lion (7), Mountain Lion (8), Mavericks (9), Yosemite (10), El Capitan (11), Sierra (12), High Sierra (13), and Mojave (14). Note 1 The PowerMac G5 had special Jaguar builds. Note 2 Tiger did not support 64-bit GUI applications, only 64-bit CLI applications. Note 3 32-bit PowerPC applications were supported on Intel processors with Rosetta. With the exception of Mac OS X Server 1.0 and the original public beta, OS X versions were named after big cats until OS X 10.9 Mavericks, when Apple switched to using California locations. Prior to its release, Mac OS X 10.0 was code named "Cheetah" internally at Apple, and Mac OS X 10.1 was code named internally as "Puma". After the immense buzz surrounding Mac OS X 10.2, codenamed "Jaguar", Apple's product marketing began openly using the code names to promote the operating system. Mac OS X 10.3 was marketed as "Panther", Mac OS X 10.4 as "Tiger", Mac OS X 10.5 as "Leopard", Mac OS X 10.6 as "Snow Leopard", Mac OS X 10.7 as "Lion", OS X 10.8 as "Mountain Lion", and OS X 10.9 as "Mavericks". "Panther", "Tiger" and "Leopard" are registered as trademarks of Apple, but "Cheetah", "Puma" and "Jaguar" have never been registered. Apple has also registered "Lynx" and "Cougar" as trademarks, though these were allowed to lapse. Computer retailer Tiger Direct sued Apple for its use of the name "Tiger". On May 16, 2005 a US federal court in the Southern District of Florida ruled that Apple's use did not infringe on Tiger Direct's trademark. On September 13, 2000, Apple released a $29.95 "preview" version of Mac OS X internally codenamed Kodiak in order to gain feedback from users. The "PB", as it was known, marked the first public availability of the Aqua interface and Apple made many changes to the UI based on customer feedback. Mac OS X Public Beta expired and ceased to function in Spring 2001. On March 24, 2001, Apple released Mac OS X 10.0 (internally codenamed Cheetah). The initial version was slow, incomplete, and had very few applications available at the time of its launch, mostly from independent developers. While many critics suggested that the operating system was not ready for mainstream adoption, they recognized the importance of its initial launch as a base on which to improve. Simply releasing Mac OS X was received by the Macintosh community as a great accomplishment, for attempts to completely overhaul the Mac OS had been underway since 1996, and delayed by countless setbacks. Following some bug fixes, kernel panics became much less frequent. Later that year on September 25, 2001, Mac OS X 10.1 (internally codenamed Puma) was released. It featured increased performance and provided missing features, such as DVD playback. Apple released 10.1 as a free upgrade CD for 10.0 users, in addition to the US$129 boxed version for people running Mac OS 9. It was discovered that the upgrade CDs were full install CDs that could be used with Mac OS 9 systems by removing a specific file; Apple later re-released the CDs in an actual stripped-down format that did not facilitate installation on such systems. On January 7, 2002, Apple announced that Mac OS X was to be the default operating system for all Macintosh products by the end of that month. On August 23, 2002, Apple followed up with Mac OS X 10.2 Jaguar, the first release to use its code name as part of the branding. It brought great raw performance improvements, a sleeker look, and many powerful user-interface enhancements (over 150, according to Apple ), including Quartz Extreme for compositing graphics directly on an ATI Radeon or Nvidia GeForce2 MX AGP-based video card with at least 16 MB of VRAM, a system-wide repository for contact information in the new Address Book, and an instant messaging client named iChat. The Happy Mac which had appeared during the Mac OS startup sequence for almost 18 years was replaced with a large grey Apple logo with the introduction of Mac OS X v10.2. Mac OS X v10.3 Panther was released on October 24, 2003. In addition to providing much improved performance, it also incorporated the most extensive update yet to the user interface. Panther included as many or more new features as Jaguar had the year before, including an updated Finder, incorporating a brushed-metal interface, Fast user switching, Exposé (Window manager), FileVault, Safari, iChat AV (which added videoconferencing features to iChat), improved Portable Document Format (PDF) rendering and much greater Microsoft Windows interoperability. Support for some early G3 computers such as "beige" Power Macs and "WallStreet" PowerBooks was discontinued. Mac OS X 10.4 Tiger was released on April 29, 2005. Apple stated that Tiger contained more than 200 new features. As with Panther, certain older machines were no longer supported; Tiger requires a Mac with 256 MB and a built-in FireWire port. Among the new features, Tiger introduced Spotlight, Dashboard, Smart Folders, updated Mail program with Smart Mailboxes, QuickTime 7, Safari 2, Automator, VoiceOver, Core Image and Core Video. The initial release of the Apple TV used a modified version of Tiger with a different graphical interface and fewer applications and services. On January 10, 2006, Apple released the first Intel-based Macs along with the 10.4.4 update to Tiger. This operating system functioned identically on the PowerPC-based Macs and the new Intel-based machines, with the exception of the Intel release lacking support for the Classic environment. Mac OS X 10.5 Leopard was released on October 26, 2007. It was called by Apple "the largest update of Mac OS X". It brought more than 300 new features. Leopard supports both PowerPC- and Intel x86-based Macintosh computers; support for the G3 processor was dropped and the G4 processor required a minimum clock rate of 867 MHz, and at least 512 MB of RAM to be installed. The single DVD works for all supported Macs (including 64-bit machines). New features include a new look, an updated Finder, Time Machine, Spaces, Boot Camp pre-installed, full support for 64-bit applications (including graphical applications), new features in Mail and iChat, and a number of new security features. Leopard is an Open Brand UNIX 03 registered product on the Intel platform. It was also the first BSD-based OS to receive UNIX 03 certification. Leopard dropped support for the Classic Environment and all Classic applications. It was the final version of Mac OS X to support the PowerPC architecture. Mac OS X 10.6 Snow Leopard was released on August 28, 2009. Rather than delivering big changes to the appearance and end user functionality like the previous releases of Mac OS X, Snow Leopard focused on "under the hood" changes, increasing the performance, efficiency, and stability of the operating system. For most users, the most noticeable changes were: the disk space that the operating system frees up after a clean install compared to Mac OS X 10.5 Leopard, a more responsive Finder rewritten in Cocoa, faster Time Machine backups, more reliable and user-friendly disk ejects, a more powerful version of the Preview application, as well as a faster Safari web browser. Snow Leopard only supported machines with Intel CPUs, required at least 1 GB of RAM, and dropped default support for applications built for the PowerPC architecture (Rosetta could be installed as an additional component to retain support for PowerPC-only applications). Snow Leopard also featured new 64-bit technology capable of supporting greater amounts of RAM, improved support for multi-core processors through Grand Central Dispatch, and advanced GPU performance with OpenCL. The 10.6.6 update introduced support for the Mac App Store, Apple's digital distribution platform for macOS applications. Mac OS X 10.7 Lion was released on July 20, 2011. It brought developments made in Apple's iOS, such as an easily navigable display of installed applications called Launchpad and a greater use of multi-touch gestures, to the Mac. This release removed Rosetta, making it incompatible with PowerPC applications. Changes made to the GUI include auto-hiding scrollbars that only appear when they are being used, and Mission Control which unifies Exposé, Spaces, Dashboard, and full-screen applications within a single interface. Apple also made changes to applications: they resume in the same state as they were before they were closed, similar to iOS. Documents auto-save by default. OS X 10.8 Mountain Lion was released on July 25, 2012. Following the release of Lion the previous year, it was the first of the annual rather than two-yearly updates to OS X (and later macOS), which also closely aligned with the annual iOS operating system updates. It incorporates some features seen in iOS 5, which include Game Center, support for iMessage in the new Messages messaging application, and Reminders as a to-do list app separate from iCal (which is renamed as Calendar, like the iOS app). It also includes support for storing iWork documents in iCloud. Notification Center, which makes its debut in Mountain Lion, is a desktop version similar to the one in iOS 5.0 and higher. Application pop-ups are now concentrated on the corner of the screen, and the Center itself is pulled from the right side of the screen. Mountain Lion also includes more Chinese features including support for Baidu as an option for Safari search engine, QQ, 163.com and 126.com services for Mail, Contacts and Calendar, Youku, Tudou and Sina Weibo are integrated into share sheets. Starting with Mountain Lion, Apple software updates (including the OS) are distributed via the App Store. This updating mechanism replaced the Apple Software Update utility. OS X 10.9 Mavericks was released on October 22, 2013. It was a free upgrade to all users running Snow Leopard or later with a 64-bit Intel processor. Its changes include the addition of the previously iOS-only Maps and iBooks applications, improvements to the Notification Center, enhancements to several applications, and many under-the-hood improvements. OS X 10.10 Yosemite was released on October 16, 2014. It features a redesigned user interface similar to that of iOS 7, intended to feature a more minimal, text-based 'flat' design, with use of translucency effects and intensely saturated colors. Apple's showcase new feature in Yosemite is Handoff, which enables users with iPhones running iOS 8.1 or later to answer phone calls, receive and send SMS messages, and complete unfinished iPhone emails on their Mac. As of OS X 10.10.3, Photos replaced iPhoto and Aperture. OS X 10.11 El Capitan was released on September 30, 2015. Similar to Mac OS X 10.6 Snow Leopard, Apple described this release as containing "refinements to the Mac experience" and "improvements to system performance" rather than new features. Refinements include public transport built into the Maps application, GUI improvements to the Notes application, adopting San Francisco as the system font for clearer legibility, and the introduction of System Integrity Protection. The Metal API, first introduced in iOS 8, was also included in this operating system for "all Macs since 2012". According to Apple, Metal accelerates system-level rendering by up to 50 percent, resulting in faster graphics performance for everyday apps. Metal also delivers up to 10 times faster draw call performance for more fluid experience in games and pro apps. macOS 10.12 Sierra was released to the public on September 20, 2016. New features include the addition of Siri, Optimized Storage, and updates to Photos, Messages, and iTunes. macOS 10.13 High Sierra was released to the public on September 25, 2017. Like OS X El Capitan and OS X Mountain Lion, High Sierra is a refinement-based update having very few new features visible to a user, including updates to Safari, Photos, and Mail, among other changes. The major change under the hood is the switch to the Apple File System, which is optimized for solid-state storage used in most new Mac computers. macOS 10.14 Mojave was released on September 24, 2018. The update introduced a system-wide dark mode and several new apps lifted from iOS, such as Apple News. As of July 2016, macOS is the second-most-active general-purpose desktop client operating system in use on the World Wide Web following Microsoft Windows, with a 4.90% usage share according to statistics compiled by the Wikimedia Foundation. It is the second most widely used desktop operating system (for web browsing), after Windows, and is estimated at approximately five times the usage of Linux (which has 1.01%). Usage share generally continues to shift away from the desktop and toward mobile operating systems such as iOS and Android. In its earlier years, Mac OS X enjoyed a near-absence of the types of malware and spyware that have affected Microsoft Windows users. macOS has a smaller usage share compared to Windows, but it also has traditionally more secure Unix roots. Worms, as well as potential vulnerabilities, were noted in 2006, which led some industry analysts and anti-virus companies to issue warnings that Apple's Mac OS X is not immune to malware. Increasing market share coincided with additional reports of a variety of attacks. In early 2011, Mac OS X experienced a large increase in malware attacks, and malware such as Mac Defender, MacProtector, and MacGuard were seen as an increasing problem for Mac users. At first, the malware installer required the user to enter the administrative password, but later versions were able to install without user input. Initially, Apple support staff were instructed not to assist in the removal of the malware or admit the existence of the malware issue, but as the malware spread, a support document was issued. Apple announced an OS X update to fix the problem. An estimated 100,000 users were affected. Apple releases security updates for macOS on a regular basis, as well as signature files for Xprotect, an anti-malware feature part of File Quarantine present since Mac OS X Snow Leopard. As a devices company, Apple has mostly promoted macOS to sell Macs, with promotion of macOS updates focused on existing users, promotion at Apple Store and other retail partners, or through events for developers. In larger scale advertising campaigns, Apple specifically promoted macOS as better for handling media and other home-user applications, and comparing Mac OS X (especially versions Tiger and Leopard) with the heavy criticism Microsoft received for the long-awaited Windows Vista operating system. ^ "What Is the I/O Kit?". IOKit Fundamentals. Apple considered several programming languages for the I/O Kit and chose a restricted subset of C++. ^ "What's New in Swift". Apple Developer (Video). June 14, 2016. At 2:40. Archived from the original on August 4, 2016. Retrieved June 16, 2016. ^ Juli Clover (March 25, 2019). "Apple Releases macOS Mojave 10.14.4 With Safari Automatic Dark Mode and Apple News+ Support". MacRumors. Retrieved March 25, 2019. ^ "macOS Mojave 10.14.4 (18E226) - Releases - Apple Developer". developer.apple.com. March 25, 2019. Retrieved March 25, 2019. ^ Juli Clover (April 8, 2019). "Apple Seeds Second Beta of macOS Mojave 10.14.5 Update to Developers". MacRumors. Retrieved April 8, 2019. ^ "macOS Mojave 10.14.5 beta 2 (18F108f) - Releases - Apple Developer". developer.apple.com. April 8, 2019. Retrieved April 8, 2019. ^ a b "macOS – How to Upgrade – Apple". Apple. Archived from the original on September 27, 2016. Retrieved September 28, 2016. ^ Apple Events - WWDC Keynote June 2016. Event occurs at 36:28. Archived from the original on September 11, 2017. ^ "Desktop Operating System Market Share". Net Applications. Archived from the original on December 3, 2014. ^ "Top 8 Operating Systems from Sept 2011 to Aug 2015". Archived from the original on May 26, 2012. ^ Ha, Anthony (June 10, 2013). "Apple Has A New, California-Based Naming Scheme For OS X, Starting With OS X Mavericks". TechCrunch. Archived from the original on July 9, 2017. Retrieved June 10, 2013. ^ "macOS Server". Mac App Store. Retrieved November 6, 2018. ^ a b "Mac OS X Version 10.5 on Intel-based Macintosh computers". The Open Group. Archived from the original on May 11, 2008. Retrieved December 4, 2014. "Mac OS X Version 10.6 on Intel-based Macintosh computers". The Open Group. Archived from the original on November 16, 2014. Retrieved December 4, 2014. "Apple technology brief on UNIX" (PDF). Apple. Archived (PDF) from the original on July 10, 2012. Retrieved November 5, 2008. "Mac OS X Version 10.8 on Intel-based Macintosh computers". The Open Group. Archived from the original on November 16, 2014. Retrieved December 4, 2014. "OS X Version 10.9 on Intel-based Macintosh computers". The Open Group. Archived from the original on November 4, 2013. Retrieved December 4, 2014. "OS X version 10.10 Yosemite on Intel-based Mac computers". The Open Group. Archived from the original on November 10, 2014. Retrieved December 4, 2014. "OS X version 10.11 El Capitan on Intel-based Mac computers". The Open Group. Archived from the original on October 15, 2015. Retrieved October 23, 2015. "macOS version 10.12 Sierra on Intel-based Mac computers". The Open Group. Archived from the original on October 2, 2016. Retrieved September 29, 2016. "macOS version 10.13 High Sierra on Intel-based Mac computers". The Open Group. Archived from the original on September 28, 2017. Retrieved November 19, 2017. "macOS version 10.14 Mojave on Intel-based Mac computers". The Open Group. Retrieved September 24, 2018. ^ Foresman, Chris (September 2010). "Apple TV definitely running iOS, could be jailbreak target". Ars Technica. Condé Nast Digital. Archived from the original on November 17, 2010. Retrieved November 16, 2010. ^ Mossberg, Walter S. (March 21, 2007). "From PC to TV – via Apple". All Things Digital. Dow Jones & Company. Archived from the original on May 20, 2008. Retrieved May 18, 2008. ^ Markoff, John (December 23, 1996). "Why Apple Sees Next as a Match Made in Heaven". The New York Times. The New York Times Company. p. D1. Archived from the original on May 31, 2008. ^ a b c d e Siracusa, John. "Rhapsody and Blues". Ars Technica. Archived from the original on November 4, 2015. Retrieved November 30, 2015. ^ "What is an operating system (OS)?". Apple. July 15, 2004. Archived from the original on February 26, 2009. Retrieved December 20, 2006. The current version of Mac OS is Mac OS X (pronounced "Mac O-S ten"). ^ Siracusa, John (March 24, 2006). "Five years of Mac OS X". Ars Technica. Condé Nast Digital. Archived from the original on June 25, 2009. Retrieved April 15, 2009. Even Steve Jobs still says "ecks" instead of "ten" sometimes. ^ Kelly, Spencer (February 26, 2011). Click - BBC TV programme. BBC. Archived from the original on March 18, 2011. Retrieved March 20, 2011. Of course X ("ex") does mean 10, but anyone who used to poke around on Unix systems will know that in those days anything Unix had an X ("ex") in it, and OS Ten is written OS X ("ex") in honour of the fact that it is based on UNIX, unlike its predecessors. So, hey, you can say it any way you want; me, I'm showing my age and sticking with X (ex). ^ a b Siracusa, John (May 13, 2011). "Here's to the crazy ones: a decade of Mac OS X reviews". Ars Technica. Archived from the original on December 8, 2015. Retrieved November 30, 2015. ^ Dalrymple, Jim (March 23, 2004). "Adobe discontinues FrameMaker for Macintosh". Macworld. Archived from the original on December 8, 2015. Retrieved November 30, 2015. ^ a b Siracusa, John. "Lion review". Ars Technica. Archived from the original on December 14, 2015. ^ Rubenstein, John (July 1, 2011). "Jon Rubinstein sends message to HP staff; Addresses TouchPad reviews". WebOS Nation. Archived from the original on December 8, 2015. Retrieved November 30, 2015. ^ Siracusa, John. "OS X Panther review". Ars Technica. Archived from the original on November 26, 2015. Retrieved November 30, 2015. ^ Gregg Keizer (January 29, 2007). "Microsoft's Vista Had Major Mac Envy, Company E-Mails Reveal". Information Week. Archived from the original on April 20, 2013. Retrieved February 28, 2013. ^ Orlowski, Andrew. "The Jagwyre Review". The Register. Archived from the original on September 20, 2017. Retrieved September 19, 2017. Using Mac OS X is like touring a land of fabulous ancient treasures - with a tourist authority that's still busy renovating them, and that hasn't quite completed the infrastructure. The sights can be breathtaking, but the roads are potholed and incomplete, and sometimes you have to get out and push. There are a few magnificent modern additions - Rendezvous, AppleScript Studio, for example - but in places the modern Apple archaeologists seem to have forgotten their ancestors techniques, and have resorted to inferior contemporary methods such as the Windows bodge of using three letter extensions for identifying the file type. ^ Thompson, Ben. "Apple and the Oak Tree". Stratechery. Archived from the original on September 20, 2017. Retrieved September 19, 2017. ^ Rizzo, John (November 12, 2003). "Mac OS X 10.3 Panther". Archived from the original on December 8, 2008. Retrieved April 15, 2009. Once you reboot, you'll notice that Apple has abandoned the light and airy Aqua interface for the darker, heavier brushed-metal look of iTunes. ^ W., Jeff (May 27, 2008). "Mac OS X (10.5) – User Interface Changes". University of Wisconsin. Archived from the original on July 20, 2011. Retrieved April 15, 2009. ^ Siracusa, John. "OS X Leopard review". Ars Technica. Archived from the original on November 25, 2015. Retrieved November 30, 2015. ^ "Mac OS X versions (builds) for computers – Apple Support". support.apple.com. Archived from the original on May 14, 2015. Retrieved May 24, 2015. ^ Chartier, David. "Apple announces Leopard delays due to the iPhone". Engadget. Archived from the original on December 8, 2015. Retrieved November 30, 2015. ^ Gruber, John. "WWDC 2009 Wrap-Up". Daring Fireball. Archived from the original on December 8, 2015. Retrieved November 30, 2015. ^ "Apple – Press Info – Apple to Ship Mac OS X Leopard on October 26". www.apple.com. Archived from the original on January 28, 2018. Retrieved January 2, 2018. ^ "Mac OS X 10.6 Snow Leopard". Apple Store (U.S.). Archived from the original on May 25, 2015. Retrieved May 24, 2015. ^ Turner, Dan. "Apple's Snow Leopard—an OS without new features". Macworld. Archived from the original on January 9, 2018. Retrieved January 8, 2018. ^ Brand, Thomas. "Apple's History of Skeuomorphism". Egg Freckles. Retrieved January 18, 2018. ^ Cunningham, Andrew. "Server, simplified: A power user's guide to OS X Server". Ars Technica. Archived from the original on December 8, 2015. Retrieved December 2, 2015. ^ Siracusa, John. "OS X Mavericks review". Ars Technica. Archived from the original on November 22, 2015. Retrieved November 30, 2015. ^ Siracusa, John. "OS X Yosemite review". Ars Technica. Archived from the original on November 24, 2015. Retrieved November 30, 2015. ^ Gruber, John. "Mountain Lion". Daring Fireball. Archived from the original on August 11, 2015. Retrieved August 15, 2015. ^ Arment, Marco. "Apple has lost the functional high ground". Retrieved August 15, 2015. ^ Hattersley, Lucy. "Mac OS X El Capitan review: The best (and worst) new features". Macworld UK. Archived from the original on May 11, 2017. Retrieved May 19, 2017. ^ "Apple just renamed one of its oldest and most important products". Business Insider. June 13, 2016. Archived from the original on November 11, 2016. Retrieved November 11, 2016. ^ Introducing Apple File System. Apple. 2016. Archived from the original on August 4, 2016. ^ "MacOS 10.13 High Sierra Announced, Release Date Set for Fall". OS X Daily. Archived from the original on June 27, 2017. Retrieved June 6, 2017. ^ a b Juli Clover (September 24, 2018). "Apple Releases macOS Mojave With Dark Mode, Stacks, Dynamic Desktop and More". MacRumors. Retrieved September 24, 2018. ^ Grothaus, Michael (April 12, 2011). "Mac OS X Lion to tone down the Aqua". The Unofficial Apple Weblog. AOL. Archived from the original on August 28, 2011. Retrieved April 9, 2012. ^ Raymond, Eric Steven. "The Elements of Operating-System Style". Archived from the original on November 12, 2008. Retrieved November 5, 2008. ^ a b "Cocoa Fundamentals Guide: A Bit of History". ADC Reference Library. Apple Developer Connection. Retrieved January 18, 2018. ^ Swapnil Bhartiya (January 13, 2015). "Linus Torvalds: Apple's HFS+ is probably the worst file system ever". CIO. Archived from the original on May 25, 2015. ^ "CVE-2014-9390 aka "Git on case-insensitive filesystems"I did not give the…". google.com. Archived from the original on November 7, 2015. ^ Robin Harris. "WWDC's biggest disappointment". ZDNet. Archived from the original on October 22, 2015. ^ "Mac OS X 10.7 Lion: the Ars Technica review". Ars Technica. Archived from the original on December 22, 2016. ^ Griffiths, Rob (February 2005). "Prevent Mac Disasters". Macworld. IDG. Archived from the original on February 21, 2009. Retrieved February 8, 2009. ^ Frakes, Dan (August 2006). "Repairing permissions: what you need to know". Macworld. IDG. Archived from the original on February 19, 2009. Retrieved February 8, 2009. ^ Frakes, Dan (June 2008). "Five Mac maintenance myths". Macworld. IDG. Archived from the original on January 23, 2009. Retrieved February 8, 2009. ^ "About the Technologies for Developing Mac OS X Software". Apple. Archived from the original on June 5, 2012. Retrieved April 4, 2012. ^ Zepko, Tom (November 6, 2003). "Why Cocoa?". Archived from the original on August 4, 2009. Retrieved April 15, 2009. ^ "Adopting Universal Binaries on Mac OS X". Apple. February 22, 2007. Archived from the original on December 20, 2008. Retrieved December 15, 2008. ^ Productions, Nyhthawk. "AppleScript: Graphic User Interface (GUI) Scripting". www.macosxautomation.com. Archived from the original on November 21, 2016. Retrieved January 3, 2017. ^ "AppleScript Introduction". whitefiles.org. Archived from the original on January 31, 2016. Retrieved January 3, 2017. ^ "The really simple guide to Automator in OS X on the Mac | RAW Mac". www.rawinfopages.com. Archived from the original on January 3, 2017. Retrieved January 3, 2017. ^ "iTunes - Download iTunes Now". Apple. June 1, 2016. Archived from the original on September 5, 2016. Retrieved September 16, 2017. ^ "iTunes - Download iTunes Now". Apple. September 16, 2015. Archived from the original on September 16, 2015. Retrieved April 16, 2017. ^ "Safari 5.1.10 for Snow Leopard". Apple. September 12, 2013. Archived from the original on February 22, 2015. Retrieved April 16, 2017. ^ "Mac OS X v10.6: "You can't use this version of Mail…" alert after installing Security Update 2012-004". Apple. March 23, 2016. Retrieved April 16, 2017. ^ "iTunes 11.4 for OS X 10.6". Apple. September 9, 2014. Archived from the original on February 11, 2015. Retrieved April 16, 2017. ^ "iTunes 10.6.3". Apple. June 11, 2012. Archived from the original on February 16, 2015. Retrieved April 16, 2017. ^ "iTunes 9.2.1". Apple. July 19, 2010. Archived from the original on February 26, 2015. Retrieved April 16, 2017. ^ "iTunes 7.7.1 for Panther". Official Apple Support Communities. August 25, 2012. Archived from the original on April 17, 2017. Retrieved April 16, 2017. ^ "iChat AV 2.1". Apple. March 23, 2004. Archived from the original on April 29, 2007. Retrieved March 16, 2017. ^ "Introduction to Cocoa-Java Integration Guide". ADC Reference Library. Apple Developer Connection. Archived from the original on August 31, 2009. Retrieved April 8, 2006. ^ a b c Nack, John. "Photoshop, Lightroom, and Adobe's 64-bit roadmap". Adobe Systems. Archived from the original on April 14, 2015. Retrieved March 30, 2016. ^ "Looking back at OS X's origins". Macworld. Archived from the original on March 17, 2017. Retrieved April 17, 2017. ^ Hall, Zac. "Back to the Mac: Microsoft releases redesigned Office for Mac 2016 Preview w/ Retina support, collaboration, more". 9to5 Mac. Archived from the original on December 28, 2017. Retrieved December 27, 2017. ^ "X11 for Mac OS X 1.0". Apple. October 28, 2003. Archived from the original on December 24, 2008. Retrieved December 15, 2008. ^ Ben Byer (October 27, 2007). "Re: X11 in Leopard: xterm on start-up". Apple's x11-users mailing list. Archived from the original on February 10, 2008. Retrieved January 18, 2008. ^ Michael Larabel (May 28, 2011). "X.Org Server 1.10.2 Brings A Bunch Of Bug-Fixes". phoronix. Archived from the original on June 3, 2011. Retrieved May 29, 2011. ^ Slivka, Eric (February 17, 2012). "Apple Removes X11 in OS X Mountain Lion, Shifts Support to Open Source XQuartz". MacRumors. Archived from the original on February 22, 2012. Retrieved February 23, 2012. ^ Counsell, Dan (November 16, 2015). "Not on the Mac App Store". Archived from the original on December 8, 2015. ^ "Distributing Apps Outside the Mac App Store". Apple Developer. Apple. Archived from the original on December 8, 2015. Retrieved December 1, 2015. ^ Kazmucha, Allyson. "How to open apps from an unidentified developer in OS X Mountain Lion". IMore. Archived from the original on November 23, 2015. Retrieved December 1, 2015. ^ "About Gatekeeper". Apple. Archived from the original on December 4, 2015. Retrieved December 1, 2015. ^ Gurman, Masrk. "Apple Plans Combined iPhone, iPad & Mac Apps to Create One User Experience". Bloomberg. Retrieved February 2, 2019. ^ Steinberger, Peter. "Marzipan: Porting iOS Apps to the Mac". PSPDFKit. Retrieved February 2, 2019. ^ Gartenberg, Chaim; Bohn, Dieter. "The future of the Mac comes from iOS apps". The Verge. Retrieved January 29, 2019. ^ Ritchie, Rene. "Marzipan: What you need to know about iOS apps on the Mac". iMore. Retrieved January 29, 2019. ^ Mayo, Benjamin. "Marzipan". benjaminmayo.co.uk. Retrieved January 29, 2019. ^ Andrew Cunningham (June 5, 2017). "Anything that can run macOS Sierra can also run macOS High Sierra". Ars Technica. Archived from the original on June 6, 2017. ^ a b "System requirements for OS X Lion and Mac OS X v10.6". Archived from the original on September 23, 2016. Retrieved September 22, 2016. ^ a b "Mac OS X: System Requirements". Apple. April 28, 2005. Archived from the original on August 9, 2007. Retrieved December 20, 2006. ^ "iMac - Tech Specs - Apple". Apple Inc. Archived from the original on July 28, 2015. Retrieved July 28, 2015. ^ "Home page – footer". tonymacx86.com. Archived from the original on July 28, 2015. Retrieved July 28, 2015. ^ K, M. "Is installing Mavericks on Hackintosh legal?". apple.stackexchange.com. Archived from the original on August 23, 2015. Retrieved July 28, 2015. ^ "Choosing the right CPU for your hackintosh". www.macbreaker.com. Archived from the original on July 11, 2015. Retrieved July 28, 2015. ^ Arment, Marco. "Far Too Much Analysis Of The Alleged New Mac Pro Geekbench Score". Marco.org. Archived from the original on April 5, 2015. Retrieved August 14, 2015. ^ Taub, Eric. "Apple sues Psystar to block Macintosh clones". NYTimes.com. New York Times. Retrieved August 1, 2015. ^ Rothenbourg, Matthew; dePlume, Nick (August 30, 2002). "Apple Keeps x86 Torch Lit with 'Marklar'". eWeek.com. Retrieved June 8, 2013. ^ Clark, Don; Wingfield, Nick (May 23, 2005). "Apple Explores Use Of Chips From Intel For Macintosh Line". The Wall Street Journal. Dow Jones & Company. Archived from the original on January 15, 2015. Retrieved February 8, 2009. ^ Kanellos, Michael (May 23, 2005). "Apple to Intel: Some advantage, lots of risk". CNET. CBS Interactive. Retrieved April 28, 2006. ^ Gruber, John. "I'll See You Intel". Daring Fireball. Archived from the original on March 13, 2016. Retrieved March 31, 2016. ^ Gruber, John. "Intel-Apple Odds and Ends". Daring Fireball. Archived from the original on June 8, 2005. Retrieved March 31, 2016. ^ Gruber, John. "Bombs Away". Daring Fireball. Archived from the original on April 11, 2016. Retrieved March 31, 2016. ^ Siracusa, John. "Picking up the pieces: John Siracusa mourns the Power PC". Ars Technica. Archived from the original on March 29, 2016. Retrieved March 31, 2016. ^ AppleInsider Staff (February 26, 2011). "Mac OS X Lion drops Front Row, Java runtime, Rosetta". AppleInsider. AppleInsider, Inc. Archived from the original on March 1, 2011. Retrieved February 27, 2011. ^ "Apple to Use Intel Microprocessors Beginning in 2006" (Press release). Apple. June 6, 2005. Archived from the original on January 30, 2018. Retrieved January 2, 2018. ^ "Adopting Universal Binaries". Apple. January 2006. Archived from the original on October 17, 2006. Retrieved December 20, 2006. ^ Landau, Ted (May 2006). "OS X First Aid". Macworld. IDG. Archived from the original on January 9, 2009. Retrieved February 8, 2009. ^ Stevens, Tim (June 10, 2009). "Snow Leopard officially puts PowerPC Macs on endangered species list". Engadget. AOL. Archived from the original on March 23, 2010. Retrieved June 15, 2009. ^ a b c Arnold Kim (February 27, 2011). "Mac OS X Lion: Drops PowerPC Emulation, Adds QuickTime Pro Features, Much More". MacRumors. Archived from the original on February 27, 2011. Retrieved February 27, 2011. ^ "The Aqua Interface". Apple Human Interface Guidelines. Apple. June 9, 2008. Archived from the original on December 9, 2008. Retrieved December 16, 2008. ^ a b Davidson, James Duncan (2002). Learning Cocoa With Objective-C. O'Reilly. p. 6. ISBN 0-596-00301-3. ^ Siracusa, John (October 28, 2007). "Mac OS X 10.5 Leopard: the Ars Technica review". Ars Technica. Condé Nast Digital. Archived from the original on December 16, 2008. Retrieved December 16, 2008. ^ Tognazzini, Bruce (February 2000). "OS X: A First Look". Archived from the original on September 27, 2008. Retrieved November 5, 2008. ^ Thomas, Matthew Paul (February 16, 2004). "My first 48 hours enduring Mac OS X". Archived from the original on October 14, 2008. Retrieved November 5, 2008. ^ "Apple lowers boom on Aqua 'skins'". ZDNet. CBS Interactive. February 2, 2001. Archived from the original on October 31, 2001. Retrieved May 22, 2006. ^ Castle, Alex. "How to make the Windows desktop look good on high-DPI displays". PC World. Archived from the original on July 11, 2015. Retrieved July 9, 2015. ^ Cunningham, Andrew. "Using the Retina MacBook as a Windows PC". Ars Technica. Archived from the original on July 9, 2015. Retrieved July 9, 2015. ^ Hutchinson, Lee. "The Retina iMac and its 5K display… as a gaming machine? [Updated]". Ars Technica. Archived from the original on July 10, 2015. Retrieved July 9, 2015. ^ O'Malley, Kevin (2003). Programming Mac OS X: A Guide for Unix Developers. Manning. p. 7. ISBN 1-930110-85-5. ^ "Mac OS X. It's what makes a Mac a Mac". Apple. Archived from the original on February 22, 2011. Retrieved March 2, 2011. ^ Girard, Dave. "Making the ultimate creative content OS from bits of Windows, Mac, and Linux". Ars Technica. Archived from the original on August 19, 2015. Retrieved August 14, 2015. ^ Holwerda, Thom (December 6, 2007). "Review: Mac OS X 10.5 Leopard". OS News. Archived from the original on May 15, 2009. Retrieved April 15, 2009. The next area where Apple claims to have made major improvements is the Finder. ^ Siracusa, John (January 26, 2006). "Finding Leopard". Ars Technica. Condé Nast Digital. Archived from the original on February 4, 2009. Retrieved April 15, 2009. Unsurprisingly, each new Mac OS X release has been the vehicle for a parade of Finder fantasies. ^ Siracusa, John (April 28, 2005). "Mac OS X 10.4 Tiger". Ars Technica. Condé Nast Digital. Archived from the original on April 2, 2009. Retrieved April 15, 2009. ^ "Mac 101: Spotlight". Apple. November 6, 2008. Archived from the original on January 19, 2009. Retrieved April 15, 2009. ^ "Mac 101: Exposé". Apple. October 31, 2008. Archived from the original on December 16, 2008. Retrieved December 16, 2008. ^ "About FileVault". Mac OS X 10.5 Help. Apple. Archived from the original on January 13, 2009. Retrieved December 16, 2008. ^ "Mac 101: Automator". Apple. November 6, 2008. Archived from the original on December 21, 2008. Retrieved December 16, 2008. ^ "Mac 101: Dashboard". Apple. November 11, 2008. Archived from the original on December 10, 2008. Retrieved December 16, 2008. ^ "Front Row". Apple. Archived from the original on December 15, 2008. Retrieved December 16, 2008. ^ "Why Use Sync Services?". Apple. October 31, 2007. Archived from the original on October 12, 2008. Retrieved December 16, 2008. ^ "Spaces. Room for everything". Apple. Archived from the original on December 15, 2008. Retrieved December 16, 2008. ^ "Time Machine. A giant leap backward". Apple. Archived from the original on December 15, 2008. Retrieved December 16, 2008. ^ "Finder". Apple. Archived from the original on December 15, 2008. Retrieved December 16, 2008. ^ Jeff Blagdon (March 4, 2013). "How emoji conquered the world". The Verge. Archived from the original on March 6, 2013. Retrieved July 28, 2014. ^ Sternbergh, Adam. "Smile, You're Speaking EMOJI: the rapid evolution of a wordless tongue". New York magazine. Archived from the original on March 26, 2017. Retrieved August 15, 2015. ^ "OS X Mountain Lion: Share with iCloud, Facebook, Twitter, and other services". Apple. Archived from the original on April 19, 2016. Retrieved August 14, 2015. ^ "13 Things You Can Do with MacOS Sierra You Couldn't Before". Gizmodo. Archived from the original on September 27, 2016. Retrieved September 28, 2016. ^ "How to use Siri in macOS Sierra: A look at using the Apple's virtual assistant on the Mac". Macworld. Archived from the original on February 4, 2017. Retrieved September 28, 2016. ^ "System – New system languages". Apple. Archived from the original on June 23, 2011. Retrieved June 6, 2011. ^ Cheng, Jacqui. "Apple's Tim Cook visits China to talk expansion, expansion, expansion". Ars Technica. Archived from the original on September 18, 2015. Retrieved August 14, 2015. ^ Foresman, Chris. "Next version of OS X to be more iOS-like than ever with Mountain Lion". Ars Technica. Conde Nast. Archived from the original on August 20, 2015. Retrieved August 14, 2015. ^ Campbell, Mikey. "Apple targets China, Japan with new OS X El Capitan system fonts and input". Apple Insider. Archived from the original on September 6, 2015. Retrieved August 14, 2015. ^ a b Panzarino, Matthew (February 16, 2012). "Apple courts China with Sina Weibo, Baidu, Youku and more integrated in Mountain Lion". The Next Web. Archived from the original on March 21, 2012. Retrieved March 15, 2012. ^ "Apple Announces Future Macintosh Operating System (OS) Strategy and Road Map". Apple.com. Apple Computer, Inc. January 7, 1997. Archived from the original on January 16, 1999. Retrieved September 18, 2018. ^ Davis, Jim (May 11, 1998). "OS X is the future for Apple". CNET. Archived from the original on September 13, 2014. Retrieved July 17, 2013. ^ Steven Borden-Weill (April 15, 2011). "Kodiak to Lion: 10 years of Mac OS X". Network World. Archived from the original on June 17, 2016. ^ "Apple Releases Mac OS X Developer Preview 4 with Final API Specs". Apple Newsroom. Retrieved September 18, 2018. ^ "Apple's Mac OS X to Ship on March 24". Apple Newsroom. Retrieved September 17, 2018. ^ "Apple Previews Next Version of Mac OS X" (Press release). Apple. July 18, 2001. Archived from the original on January 3, 2018. Retrieved January 2, 2018. ^ "Apple Previews "Jaguar", the Next Major Release of Mac OS X" (Press release). Apple. May 6, 2002. Archived from the original on January 3, 2018. Retrieved January 2, 2018. ^ "Apple Previews Mac OS X "Panther"" (Press release). Apple. June 23, 2003. Archived from the original on January 3, 2018. Retrieved January 2, 2018. ^ "Steve Jobs to Kick Off Apple's Worldwide Developers Conference 2004 with Preview of Mac OS X "Tiger"" (Press release). Apple. Archived from the original on January 3, 2018. Retrieved January 2, 2018. ^ "Apple Executives to Preview Mac OS X "Leopard" at WWDC 2006 Keynote" (Press release). Apple. Archived from the original on January 3, 2018. Retrieved January 2, 2018. ^ "Road to Mac OS X Snow Leopard: 64-bit to the Kernel". AppleInsider. October 28, 2008. Archived from the original on September 28, 2015. Retrieved September 28, 2015. 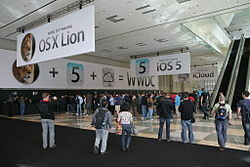 ^ "Apple Previews Mac OS X Snow Leopard to Developers" (Press release). Apple. June 9, 2008. Archived from the original on November 1, 2017. Retrieved January 2, 2018. ^ "Apple Gives Sneak Peek of Mac OS X Lion" (Press release). Apple. October 20, 2010. Archived from the original on January 3, 2018. Retrieved January 2, 2018. ^ "Older 64-bit Macs out of the picture for Mountain Lion". CNET. July 11, 2012. Archived from the original on October 1, 2015. Retrieved September 28, 2015. ^ "Apple Releases OS X Mountain Lion Developer Preview with Over 100 New Features" (Press release). Apple. February 16, 2012. Archived from the original on November 23, 2017. Retrieved January 2, 2018. ^ a b "Mountain Lion Available Today From the Mac App Store" (Press release). Apple. July 25, 2012. Archived from the original on October 10, 2017. Retrieved January 2, 2018. ^ "Apple Releases Developer Preview of OS X Mavericks With More Than 200 New Features" (Press release). Apple. June 10, 2013. Archived from the original on February 13, 2018. Retrieved January 2, 2018. ^ "Apple releases OS X 10.9 Mavericks with reliability enhancements, includes Safari 7.0.6". appleinsider. Archived from the original on December 18, 2014. Retrieved on December 18, 2014. ^ "Apple Announces OS X Yosemite" (Press release). Apple. June 2, 2014. Archived from the original on October 9, 2017. Retrieved January 2, 2018. ^ "Apple Announces OS X El Capitan with Refined Experience & Improved Performance" (Press release). Apple. June 8, 2015. Archived from the original on October 8, 2017. Retrieved January 2, 2018. ^ "Apple previews major update with macOS Sierra" (Press release). Apple. June 13, 2016. Archived from the original on January 3, 2018. Retrieved January 2, 2018. ^ Kasper, Jade. "Court sides with Apple over "Tiger" trademark dispute". AppleInsider. Archived from the original on September 27, 2007. Retrieved April 25, 2006. ^ John Siracusa. "Mac OS X Beta – Page 1 – (10/2000)". Ars Technica. Condé Nast Digital. Archived from the original on October 30, 2009. Retrieved March 11, 2010. ^ "Mac OS X Public Beta Expires Today | News". The Mac Observer. Archived from the original on June 8, 2011. Retrieved March 11, 2010. ^ Although the version is now called Cheetah by users, rare evidences can be found to prove that it was called so internally. For instance, a Q&A was created in 2005 which mentions it. "Technical Q&A". Apple. October 4, 2005. Archived from the original on May 18, 2008. Retrieved December 20, 2006. ^ "Mac OS X 10.0". Ars Technica. Archived from the original on April 17, 2017. Retrieved April 17, 2017. ^ a b c "Mac OS X 10.0 - Page 17 - (03/2001)". archive.arstechnica.com. Archived from the original on August 17, 2016. Retrieved April 29, 2017. ^ Williams, Justin (March 11, 2008). Getting StartED with Mac OS X Leopard. Apress. ISBN 9781430205197. ^ "Apple Cease-And-Desists Stupidity Leak". Slashdot. 2001. Archived from the original on January 13, 2013. Retrieved November 5, 2008. ^ "Apple Makes Mac OS X the Default Operating System on All Macs" (Press release). Apple. January 7, 2002. Archived from the original on October 10, 2017. Retrieved January 2, 2018. ^ "Jaguar "Unleashed" at 10:20 pm Tonight" (Press release). Apple. August 23, 2002. Archived from the original on January 3, 2018. Retrieved January 2, 2018. ^ "Mac OS X 10.2 Product Information Page". Apple. August 29, 2002. Archived from the original on August 29, 2002. Retrieved June 12, 2008. ^ "Apple Previews "Jaguar," the Next Major Release of Mac OS X" (Press release). Apple. May 6, 2002. Archived from the original on January 3, 2018. Retrieved January 2, 2018. ^ Thomas, Tommy. "Murder on Macintosh Row: Happy Mac, 1984-2002". lowendmac.com. Archived from the original on January 3, 2018. Retrieved April 29, 2017. ^ "Apple Announces Mac OS X "Panther"" (Press release). Apple. October 8, 2003. Archived from the original on January 3, 2018. Retrieved January 2, 2018. ^ "Mac OS X 10.3 Panther". Low End Mac. October 24, 2003. Archived from the original on December 30, 2016. Retrieved December 31, 2016. ^ "Apple Unleashes "Tiger" Friday at 6:00 p.m." (Press release). Apple. April 28, 2005. Archived from the original on March 22, 2018. Retrieved January 2, 2018. ^ "Apple unveils Intel iMacs". AppleInsider. January 2006. Archived from the original on January 13, 2009. Retrieved December 15, 2008. ^ "Apple – Mac OS X Leopard – Features – 300+ New Features". Apple. 2008. Archived from the original on May 1, 2008. Retrieved June 13, 2008. ^ "Apple – BootCamp". Apple. 2006. Archived from the original on June 2, 2006. Retrieved June 5, 2006. ^ "Mac OS X Leopard – Technology – UNIX". Leopard Technology Overview. Apple. Archived from the original on June 9, 2011. Retrieved October 26, 2007. Leopard is now an Open Brand UNIX 03 Registered Product, conforming to the SUSv3 and POSIX 1003.1 specifications for the C API, Shell Utilities, and Threads. ^ "Do Classic applications work with Mac OS X 10.5 or Intel-based Macs?". Knowledge Base. Apple. January 13, 2006. Archived from the original on October 25, 2007. Retrieved October 25, 2007. ^ Cheeseman, Bill (April 26, 2010). Cocoa Recipes for Mac OS X. Pearson Education. ISBN 9780321702883. ^ Lynch, Steven (June 12, 2008). "Mac OS X Snow Leopard Drops PowerPC Support". HardOCP. Archived from the original on September 27, 2011. Retrieved October 20, 2010. ^ "The 64-Bitness of Mac OS X 10.6 Snow Leopard". Low End Mac. August 19, 2009. Archived from the original on December 27, 2016. Retrieved December 31, 2016. ^ Reisinger, Don (January 6, 2011). "Mac App Store launches on Snow Leopard". CNET. CBS Interactive. Archived from the original on August 10, 2012. ^ "Apple – OS X Lion – The world's most advanced desktop operating system". Apple. October 20, 2010. Archived from the original on May 23, 2011. Retrieved October 20, 2010. ^ "Mac OS X 10.7 Lion Review - Document Model". Ars Technica. July 20, 2011. Archived from the original on December 20, 2016. Retrieved December 11, 2016. ^ "Apple – OS X Mountain Lion – The world's most advanced desktop operating system". Apple. February 16, 2012. Archived from the original on February 16, 2012. Retrieved February 16, 2012. ^ "Inside OS X 10.8 Mountain Lion: Apple overhauls software updates, App Store". AppleInsider. Archived from the original on July 6, 2016. Retrieved April 29, 2017. ^ Slivka, Eric. "Software Update to Move Inside Mac App Store in OS X Mountain Lion". Archived from the original on July 1, 2016. Retrieved April 29, 2017. ^ Gupta, Poornima; Chan, Edwin (October 22, 2013). "Apple gives away Mac software, unveils iPad Air". Reuters. Archived from the original on February 4, 2017. ^ "OS X Mavericks Available Today Free from the Mac App Store" (Press release). Apple Inc. October 22, 2013. Archived from the original on October 10, 2017. ^ Siracusa, John. "Yosemite review". Ars Technica. Archived from the original on July 20, 2017. ^ Gibbs, Samuel (April 16, 2015). "Upgrading from iPhoto or Aperture to Apple's Photos? Read this". The Guardian. London. Archived from the original on May 27, 2018. Retrieved July 27, 2017. ^ Dhiraj, Rav (June 2015). "What's New in Metal, Part 1" (pdf). Apple Developer. Apple. p. 84. Archived (PDF) from the original on June 17, 2015. Retrieved June 17, 2015. ^ "Apple - Press Info - Apple Announces OS X El Capitan with Refined Experience & Improved Performance" (Press release). Apple Inc. Archived from the original on June 8, 2015. ^ "macOS". Archived from the original on September 26, 2016. Retrieved September 26, 2016. ^ "Siri for Mac: How it works in Apple's macOS Sierra and what it's capable of". AppleInsider. Archived from the original on October 1, 2016. Retrieved September 28, 2016. ^ Dillet, Romain. "Apple is releasing macOS High Sierra on September 25". TechCrunch. Archived from the original on October 13, 2017. Retrieved October 12, 2017. ^ "MacOS 10.13 High Sierra Release Date Set for Fall". OS X Daily. June 5, 2017. Archived from the original on June 27, 2017. Retrieved October 12, 2017. ^ "Apple macOS High Sierra preview: the biggest Mac update you'll never see". The Verge. Archived from the original on October 13, 2017. Retrieved October 13, 2017. ^ "Wikimedia Traffic Analysis Report - Operating Systems, Jun27-Jul31, 2016". Archived from the original on May 3, 2017. ^ Welch, John (January 6, 2007). "Review: Mac OS X Shines In Comparison With Windows Vista". Information Week. Archived from the original on February 9, 2007. Retrieved February 5, 2007. ^ Granneman, Scott (October 6, 2003). "Linux vs. Windows Viruses". The Register. Archived from the original on September 7, 2015. Retrieved February 5, 2007. ^ Gruber, John (June 4, 2004). "Broken Windows". Daring Fireball. Archived from the original on September 4, 2011. Retrieved April 24, 2006. ^ "Operating System Market Share". September 2009. Archived from the original on January 25, 2010. Retrieved April 10, 2009. ^ Roberts, Paul (February 21, 2006). "New Safari Flaw, Worms Turn Spotlight on Apple Security". eWeek. Retrieved November 23, 2007. ^ Conneally, Tim (August 28, 2009). "'Macs don't get viruses' myth dissolves before public's eyes". BetaNews.com. Archived from the original on August 30, 2009. ^ Grimes, Roger A. (May 23, 2011). "7 questions about the Mac malware scare | Security". InfoWorld. Archived from the original on June 7, 2011. Retrieved July 5, 2011. ^ "Mac Security Boasts Threatened by Malware Surge – International Business Times". Ibtimes.com. May 26, 2011. Archived from the original on August 8, 2011. Retrieved July 5, 2011. ^ Trenholm, Rich (May 20, 2011). "Apple tells support staff not to confirm Mac Defender infections". UK: Crave. Archived from the original on May 22, 2011. Retrieved July 5, 2011. ^ Seltzer, Larry (May 25, 2011). "Mac Defender 2.0 Released – Security Watch". PC Mag. Archived from the original on July 17, 2011. Retrieved July 5, 2011. ^ "Apple security updates". Apple. January 21, 2009. Archived from the original on February 5, 2009. Retrieved January 29, 2009. ^ "XProtect Explained: How Your Mac's Built-in Anti-malware Software Works". How-To Geek. May 18, 2015. Archived from the original on March 23, 2018. ^ Nudd, Tim. "Apple's Get a Mac campaign". AdWeek. Archived from the original on October 5, 2011. Retrieved December 2, 2015. ^ Arthur, Charles. "Apple tweaks Microsoft over Vista ad spending". The Guardian. Archived from the original on December 8, 2015. Retrieved December 2, 2015.